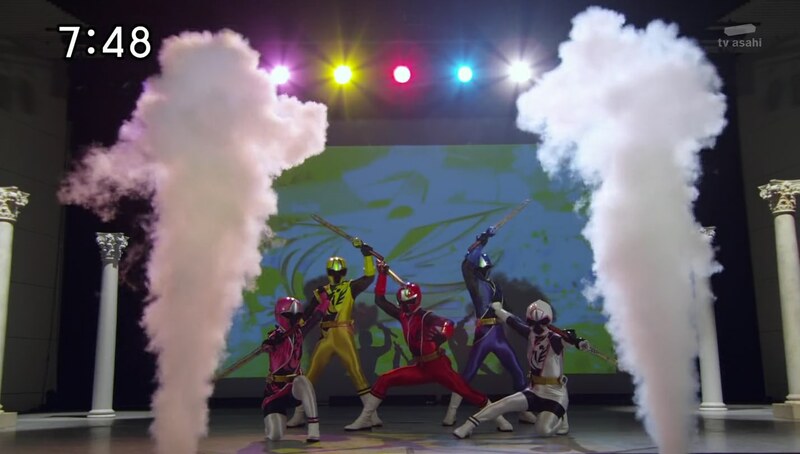 Recap: Shuriken Sentai Ninninger, Episode 9 – Ninjutsu vs. Magic, the Great Battle! Starninger has just easily taken care of a Youkai. He takes the Sealing Shuriken, but just tosses it aside when he sees it isn’t what he’s looking for. He runs off when the Ninningers arrive, having been alerted by the Gamagama-ju. They wonder where the Youkai is, but they see the Sealing Shuriken on the ground. 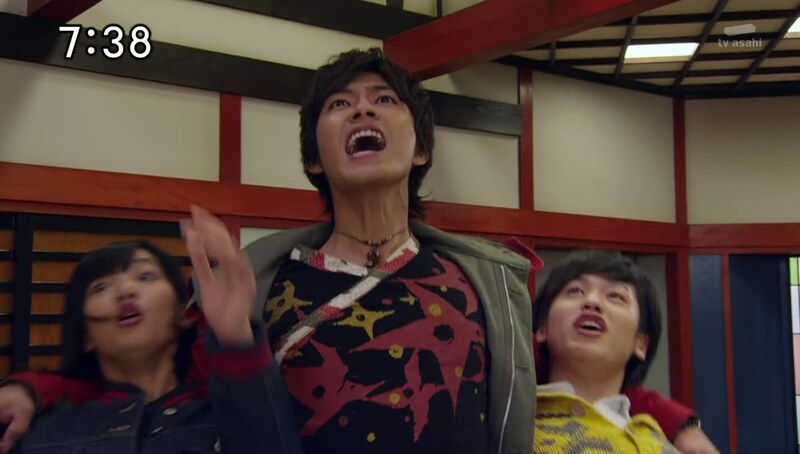 Takaharu thinks it’s hot that there’s someone else out there defeating Youkais. The Ninningers hurry back home to turn on the news. They make it just in time to watch a story on the arrival of famous designer Katou Harukaze who is back in Japan to introduce her new line. The Ninningers are excited to see their Aunt, Yakumo’s mom, on TV. That is, everyone except Yakumo who says they should figure out what’s going on with the Youkai lately. The cousins ask Father just what the Finishing Shuriken actually is and he tells them it is said to have the power to end the world. And it is the Last Ninja’s responsibility to protect it. 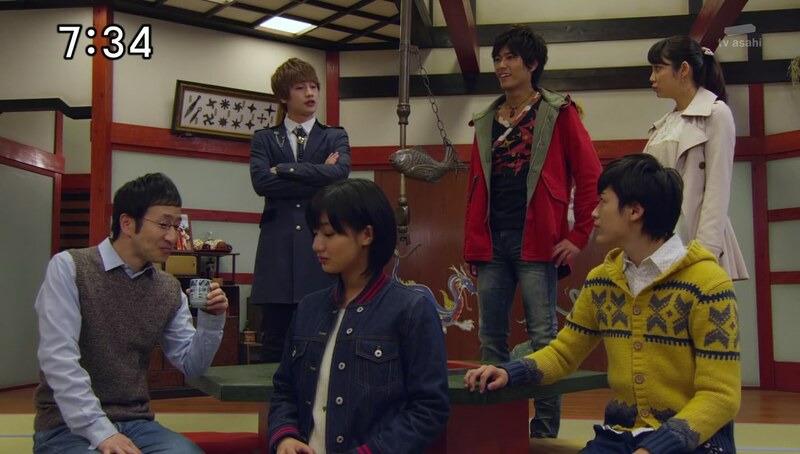 That must mean Grandpa has it, but Takaharu remembers when Grandpa told Kyuuemon that he didn’t have it. Just like the one on his Neesan’s brand new featured dress! Haruka-neesan is showing off her new design on the news and Father confirms that it is indeed the Finishing Shuriken of the End! Kyuuemon is reading the fashion mags and sees the Finishing Shuriken of the End. Gabi Raizou doubts her ability to retrieve it. But he’ll help her out a bit. He first gives her a Sealing Shuriken to create a Youkai with. He then summons some Kurokages and upgrades them into Jukkarages! Meanwhile, Cloud has called his mother to tell her what’s going on. She is surprised he’s become an old-fashioned ninja as she’s more interested in his magic studies instead. But he asks her to tell him about the Shuriken. Mommy Haruka says she got it from the dojo and thought it could be used as a cute accessory. She didn’t know it was a Shuriken. Cloud asks if she can return it to them, but she says no and hangs up. Yakumo asks Uncle to talk to her, but Father says big sis would never listen to him. They think about asking Grandpa then, but they have no idea how to contact him. Yakumo says they’ll just have to find a way to take it from his mom themselves. Takaharu thinks that’s a hot idea. He meets with the others who are already in the basement as he tells them all the intel he’s gathered. Kasumi shows them a fake Finishing Shuriken of the End to replace the real one so as not to disrupt Auntie’s fashion show. The Ninningers stealthily work their way inside. But also here is Kyuuemon. She attaches Gabi Raizou’s Sealing Shuriken onto a carpet to bring Youkai Ittanmomen to life. She asks him to get the Finishing Shuriken. The Gamagama-jus are reacting, but they don’t know where the Youkai is. Actually, it’s right in front of them. Ittanmomen, who was pretending to be a regular carpet, pops up and zaps Fuuka with a spell turning her into a mouse. Yakumo recognizes the Youkai is using magic and he will definitely not lose against another mage. They all henge, but the Jukkarage appear. The Ninningers are surprised by the stronger foot soldiers. Ittanmomen demands they tell him where the Finishing Shuriken is. Nagi refuses, but the Youkai casts a spell to force him to spill the beans. 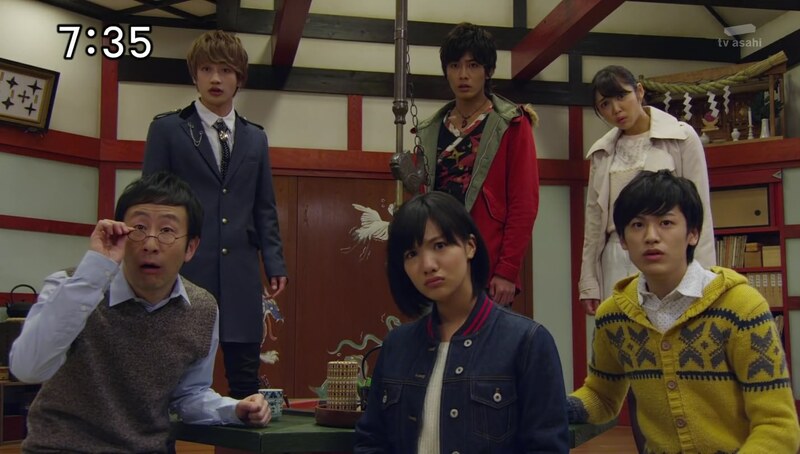 Ittanmomen disappears and the Ninningers pursue, Takaharu picking up Fuuka in his hand. But Ittanmomen suddenly pops out of the ceiling and turns Kasumi into a mouse too. Yakumo uses Gold Technique to pin the Youkai to the wall and the guys continue on, Takaharu putting Fuuka and Kasumi into a cage. The guys reach the door to the hall, but Ittanmomen turns Nagi into a stone. 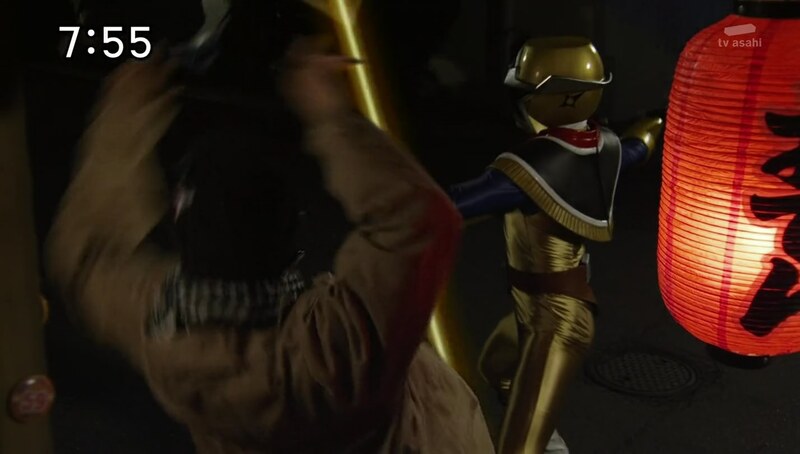 More Jukkarage appear and Yakumo uses Kakuranger Cloning Technique to help fight. The Youkai thinks he’s in the clear, but a hole appears in the floor and he falls in. 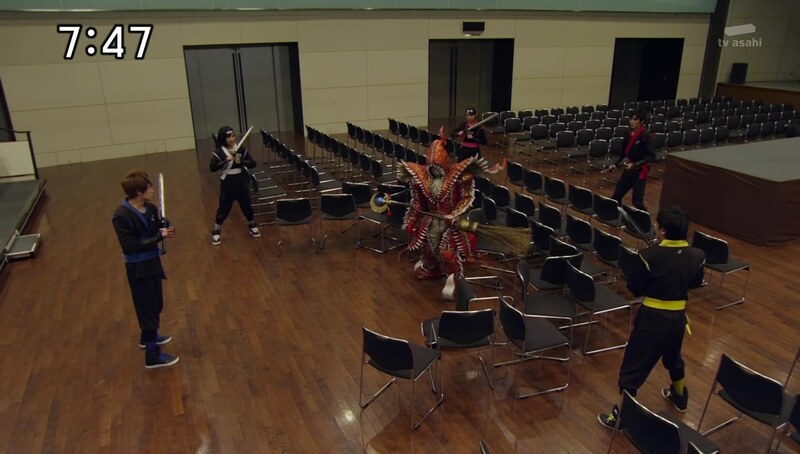 Takaharu takes the mice and stone and he and Yakumo head into the hall. But as they make their way backstage, Ittanmomen again casts a spell and turns Takaharu into a Bandai action figure! Ittanmomen comes out from backstage with Mommy Haruka as his hostage. He says she’ll be fine as soon as he gets the Finishing Shuriken of the End. The Jukkarage roll the mannequin with the Shuriken dress out and they get ready to leave. But Cloud thinks. He asks them to wait a moment. The reply comes from a Jukkarage! It puts on the dress and attacks the other Jukkarage while getting Mommy Haruka safely to Cloud. Cloud asks his Mommy if she’s okay as he tosses his sword to the Jukkarage who turns out to be Kasumi. Kasumi compliments Yakumo-kun for realizing it was her. Turns out she used Substitution Technique to avoid the mouse spell. Cloud asks his neechan to stop teasing and Auntie asks Kasumi to just call her Aunt instead. Yakumo faces Ittanmomen and sends a dispelling spell to reverse the spells on the others. Ittanmomen just blocks it, but Yakumo has just used Cloning Technique and takes the Youkai by surprise from behind. The spell works and the others are back to their normal selves. Ittanmomen can’t believe it. 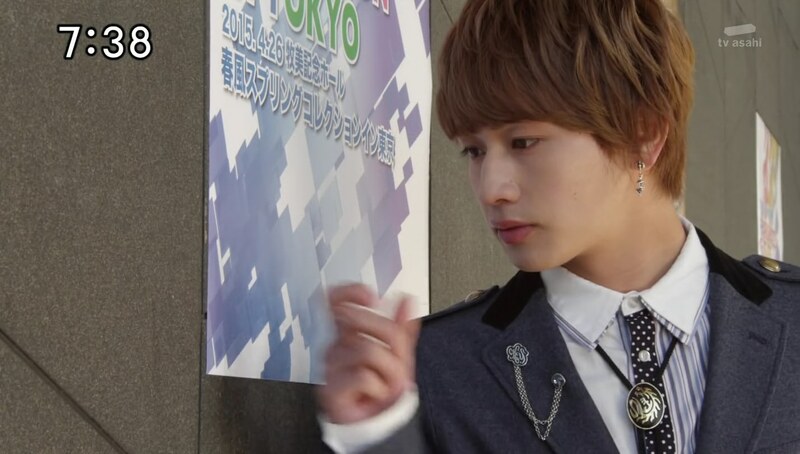 Yakumo calls himself a magic ninja. 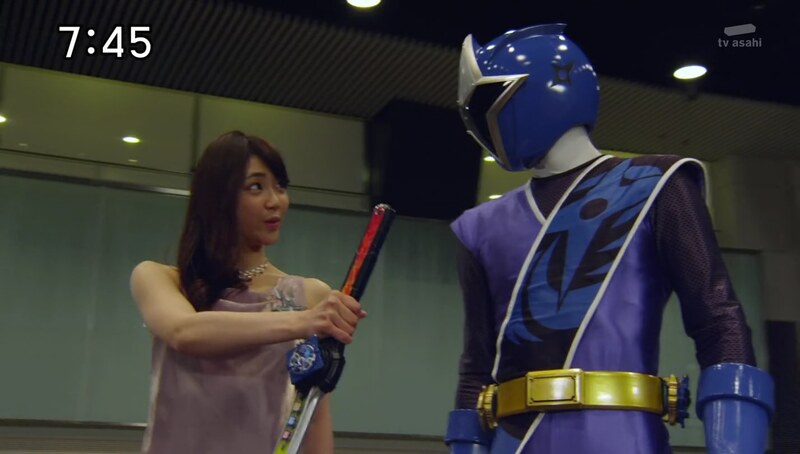 Kasumi gives Takaharu the Finishing Shuriken of the End and the five of them henge. After a big screen roll call, they take the fight outside. Yakumo counters Ittanmomen’s spells by turning the Jukkarage into turtles. 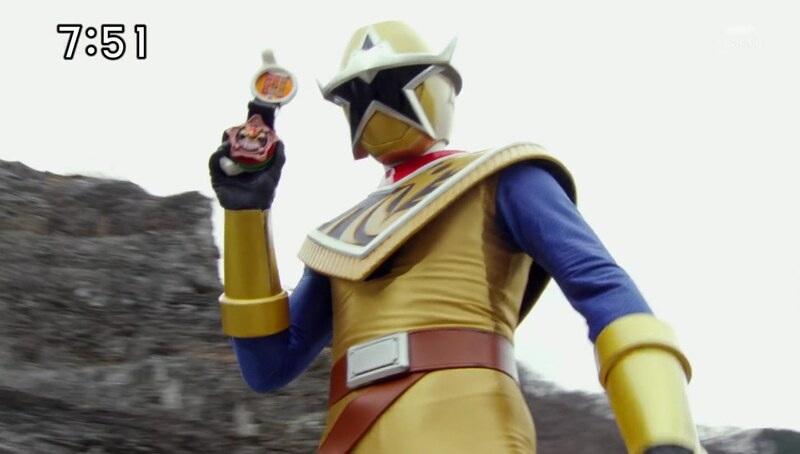 He suggests that he and Takaharu combine ninjutsu and magic. They deliver a Magical Nin Shuriken Flash and take care of Ittanmomen. Suddenly, the Finishing Shuriken is getting pulled from Takaharu. It’s Kyuuemon. 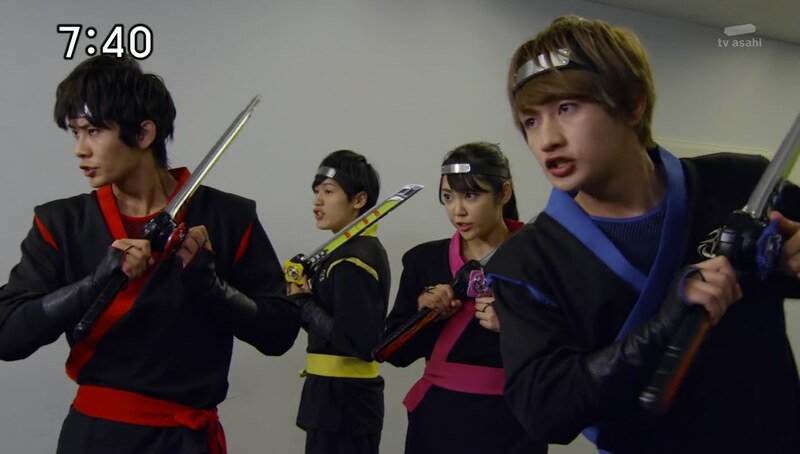 The others come to grab hold of Takaharu to keep Kyuuemon from taking the Shuriken. But the Shuriken suddenly breaks in half. It was a fake. But Kasumi still has the fake one she made. Maybe the dress Shuriken was fake from the beginning. Starninger watches from around the corner. Kyuuemon embiggens Ittanmomen before jumping away. The Ninningers hop into Shurikenjin Drago. But Ittanmomen turns Shurikenjin into stone. Yakumo has no way to undo the spell. 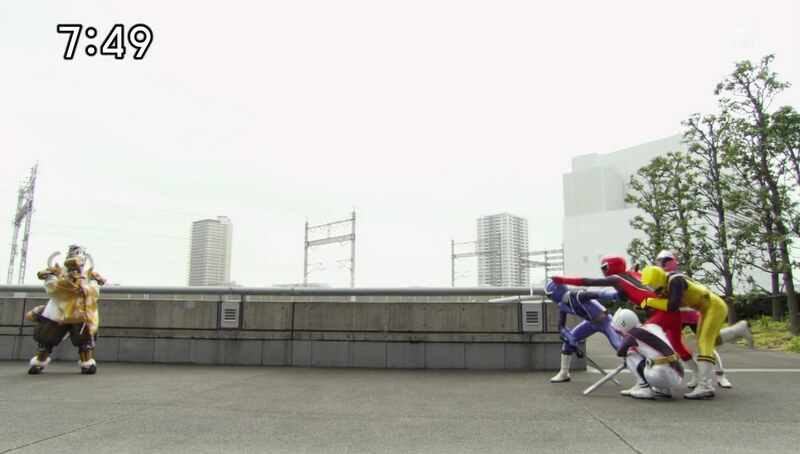 Suddenly, Starninger appears and summons Rodeomaru and Bison Buggy. 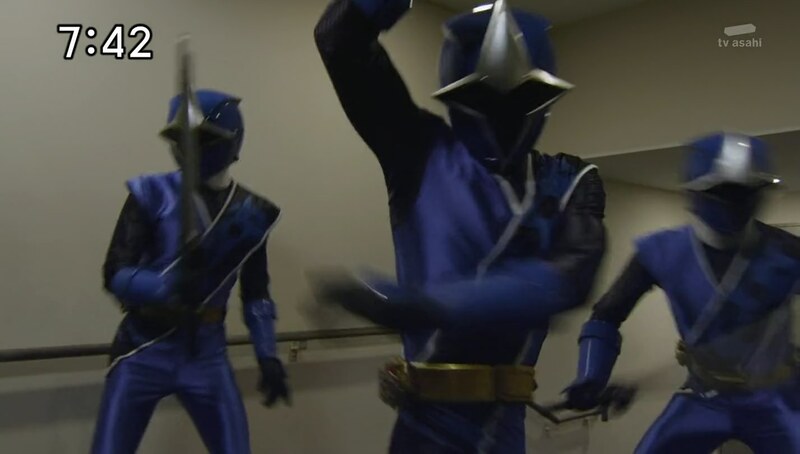 The Ninningers think these are new Otomo Nin, but none of the Sealing Shurikens they have transformed. Starninger hops onto Rodeomaru who is very stealthy as it boxes Ittanmomen and lassos his staff away. That allows Shurikenjin Drago to break free of the stone. 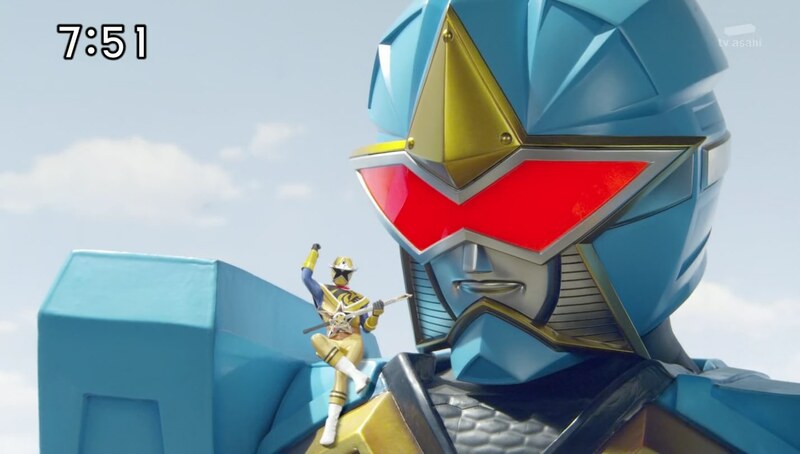 The Ninningers use a Drago Burst to get at Ittanmomen, but Starninger uses Shurikenjin as a launching pad for Rodeomaru to hop onto Bison Buggy. He initiates a Bison Change to form BisonKing. Starninger uses a Wild Buster attack to finish off Ittamomen for good. Back at home, Cloud calls Mo… Mother and apologizes for breaking the not-Shuriken brooch. She says it’s okay. What’s important is that she is happy to see them all fighting and for showing her ninjas are actually cool. She encourages him to do what he wants to do. Yakumo is thankful for the message. But now, if the Shuriken was a fake, where’s the real one? Only Grandpa knows probably. Speaking of, Grandpa is closing up his food cart for the night. 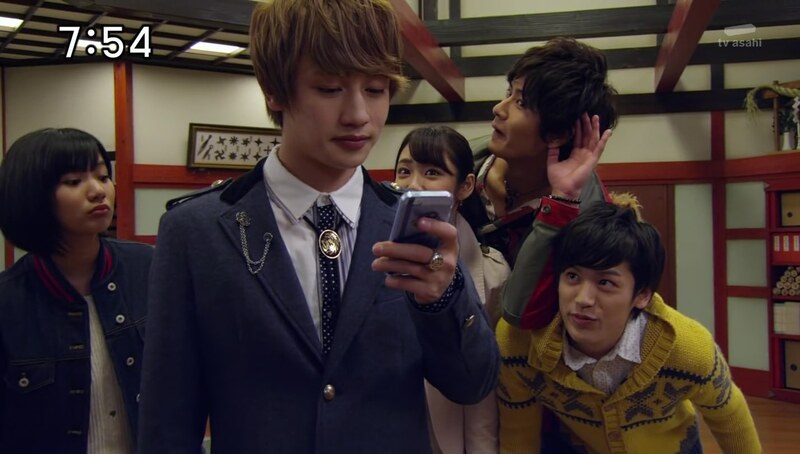 But Starninger appears behind him. And we meet Cloud’s Mommy. That was what I enjoyed the most. I’ll say it every week, I very much enjoy seeing the family dynamics the most. 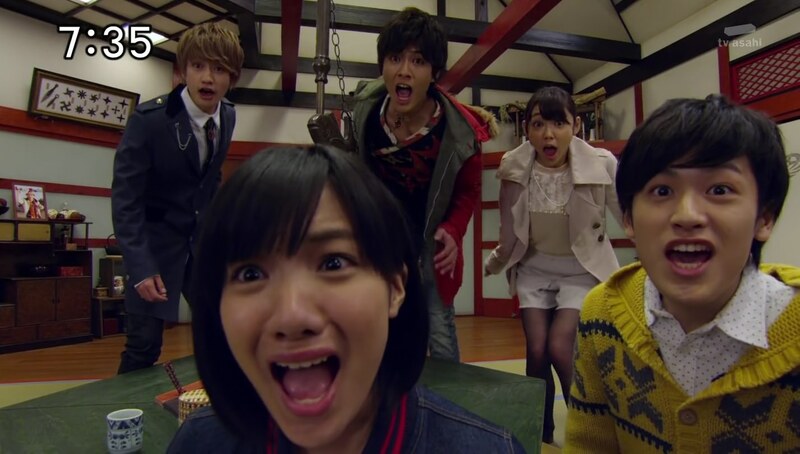 Just like I enjoyed seeing all the friendship dynamics the most in ToQger. So it was awesome and fun to see Cloud with his Mommy and even a few lines between Kasumi and Auntie. Also nice to have Father also be included and help make clear that he and Auntie are the siblings/Last Ninja’s non-ninja children. It was great to have powered up foot soldiers, I don’t seem to remember having any in the last few seasons? And Starninger, so far, is interesting enough. Hope they have a good story arc for his introduction. Rodeomaru, like Shinobimaru, is awesome though! 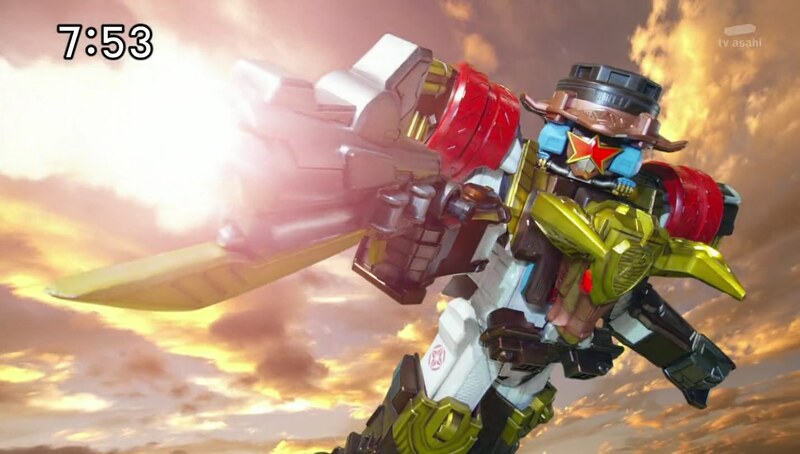 It’s very fun to see such nimble humanoid zords/mecha. ← Recap: The Amazing Race 26, Episode 9 – "I'm always right and you never listen." i liked this episode and I already watched episode 12 so i wont spoil it for ya. I laughed so hard when Yakumo said “mommy” thats sounds weird to me because i’m British. Anyway funny episode. cool blue has a kid side.